Not a lot to say about this one. Despite the label, there is very little information about its provenance. 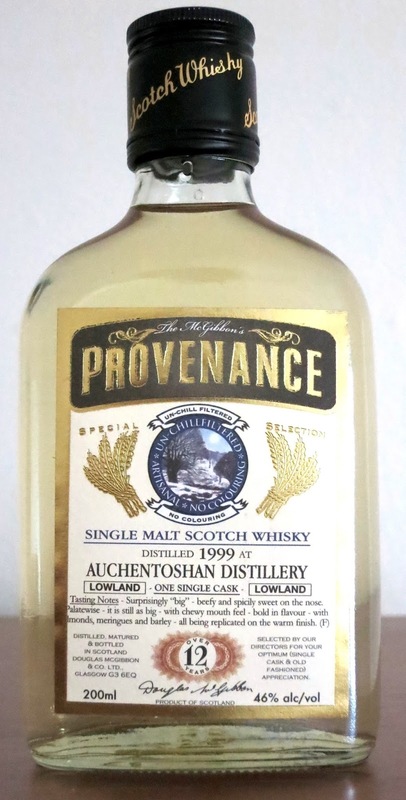 It was distilled at Auchentoshan sometime in 1999, aged for at least 12 years in an oak cask, then bottled at 46% without coloring or chill filtration for Douglas Laing's McGibbon's Provenance line. Nose: thick bourbon cask influence, spicy oak, a little sour and funky (Jamaican rum-style), overripe fruit. After adding a few drops of water the funk is amplified and it is much drier overall. Taste: rich, creamy malt and American oak sweetness throughout, fading towards bittersweet at the back, generically fruity with dunder funk around the middle, soft oak tannins around the back. After dilution the funk grows much stronger and suppresses much of the sweetness, while the oak tannins also become stronger and more bitter at the back. In most respects this seems like a fairly basic bourbon cask malt. The funkier notes that remind me of Jamaican rums. It's not impossible that this is a rum cask matured or finished malt, but that seems a little unlikely given that Provenance is the more bare-bones line of single malt from Douglas Laing. But whatever the source, that character keeps it from being generic or boring. With that said, water amplifies the funk a bit too much even for me and throws the malt out of balance. Unless you're really into those notes - and even then you might as well drink Jamaican rum instead - I'd hold off on the water. This was already reduced as far as it could reasonably go. Beyond it being a nice distillery with a well-done tour, one of the reasons to visit Auchentoshan is that they usually offer a number of single cask bottlings only available at the distillery shop. Conveniently these are available in either 200 mL or 700 mL bottles, which I appreciated since it was the first stop on my bike tour of Scotland and I knew I would be carrying whatever I bought for several weeks. When I was there they had a younger and an older single cask on offer. I went with the younger one, both because of the price and because I read reviews suggesting that it was the better pick. This whisky was distilled on August 24th, 1999, filled into an ex-bourbon barrel (probably first-fill), then bottled on August 26th, 2013 at 52.8% without coloring or chill filtration. Nose: rich and spicy bourbon cask influence - honey, moderate oak, clove/cinnamon/nutmeg, vanilla frosting, creamy malt, savory, huge fruit/berry/peach/pineapple notes in an almost sherried mode. After adding a few drops of water the oak becomes drier, but the honey and berries are amplified, the vanilla turns into whipped cream, and everything is more integrated in general. Taste: thick and sweet, undergirding oak, caramel, indeterminate fruitiness starting around the middle, citrus (lemon and grapefruit) and savory notes at the back. After dilution the sweetness integrates with the oak, the fruitiness spreads out, and the savoriness at the back gets bigger, and it all seems more bourbon-y. Out of the distillery-only bottles I brought back from Scotland, this is the one I most wish I had more of. It hits almost all of the notes that I like about well-done bourbon without the overly aggressive caramel and oak, letting the fruit notes shine. 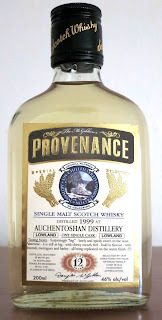 While they're not at full strength, van Wees has released a number of similar 1999 vintage Auchentoshan bourbon barrels that I'm going to have to try to see if they can capture some of what I liked about this cask. One of the things I was most excited about in the Cadenhead's shop in Campbeltown was getting to try more full strength Hazelburn. With a few exceptions it's very rare in the US. But the living casks at the Cadenhead's shop will scratch that itch. Surprisingly, since Hazelburn has only been distilled at Springbank since 1997, the proof of the Hazelburn living cask was quite low at 48.2% when I visited on August 31, 2013. Looking at the bottles reported at WhiskyBase, it appears this has held up, suggesting that most of the casks added to the mix have had abnormally low ABV for their (presumably low) age. So while these may not be the most representative casks, they should be something interesting. Nose: warm caramel, rich brine, solid oak, oily (motor/olive), dry malt, floral, hints of moss, green tea, and sherry. After adding a few drops of water the caramel and brine are amplified, the fruit becomes muskier, and the oil becomes more firmly olive. Taste: moderate malt and wood sweetness up front, becomes bittersweet with oak and tea tannins around the middle, joined by a light bump of vague fruit and floral esters, finishes with mild brine near the back. After dilution it becomes much softer and more integrated, with the tannic and bitter components dissolving into the sweeter wood. This one took some time and air to open up. When I first popped the cork it was tight and resembled the red stripe Hazelburn 8 Year Cask Strength, which was pretty unappealing. With time it became much more rich and had more in common with the Hazelburn 8 Year Bourbon Single Cask I liked so much. Like the 1842 Campbeltown blended malt, this isn't a world-beater, but I really enjoyed it. This cements my feeling that I vastly prefer bourbon cask matured Hazelburn to anything from sherry casks, which seem to override the salted caramel character that I enjoy. I really need to try the new Hazelburn 10 Year, which should be in the same ballpark. My visit to Springbank and Glengyle ended at the Cadenhead's shop in Campbeltown, where everyone on the tour was given a miniature bottle of Springbank whisky to take with them. Presumably because it's treated as a gift rather than a sale, these bottles have none of the standard information we expect on the label, such as ABV. But that makes it an interesting mystery. Nose: gobs of leathery Campbeltown character, mossy peat, juniper/rosemary, cured meat, dry malt, fresh bread dough, citrus pith, hay. After adding a few drops of water it remains much the same, but the peat becomes fresher and the cured meat becomes more pronounced. Taste: sweet malt up front with some oak tannins underneath, vague fruit/berry/sherry notes in the background, leathery/mossy peat begins around the middle and expands towards the back, dry hay something oily going into the finish. After dilution the initial sweetness fades more quickly and the oak/leather/peat combo becomes more bitter but also give it more of an oaky heft. This is simple, but hits all the classic Springbank notes. While I'm guessing this is mostly young-ish bourbon cask Springbank, the roundness and berries suggest there might be some sherry casks in the mix as well. Either way, it's pretty similar to standard Springbank 10 Year, so I wouldn't get overly worked up about finding this. It's a nice treat if you visit the distillery and a good introduction to the style for anyone visiting Campbeltown, but nothing mindblowing. One of the best things about visiting a Cadenhead's shop is their living casks. These are single malts, blended malts, and rums that are maintained in a solera style. This means that whenever a cask starts to get low more spirit from new casks is added to maintain their volume. This means that the living casks are constantly evolving, so what you get one day may be different than what's in the cask weeks or months later. This was taken from the Campbeltown blended malt cask, which likely contains a mix of Springbank, Hazelburn, Longrow, Kilkerran/Glengyle, and Glen Scotia, during my visit to Campbeltown on August 31st, 2013. It is at 54.4% without coloring or chill filtration. Nose: rich malt overlaid with a melange of damp peat smoke, leather, oak, nutmeg, and coastal notes, grapefruit peel, green cardamom, turmeric, peanut butter. After adding a few drops of water the leather notes become stronger and more fresh, the peat becomes softer and drier, the malt turns into fresh dough. Taste: slightly dirty malt and oak sweetness up front, shifting towards bittersweet as the oak becomes tannic, gentle peat and coal smoke come in around the middle, orange peel overtones and apple cider undertones, becoming more mossy and tannic at the back. After dilution the sweetness carries through further, the peat and oak are toned down, some floral notes are revealed around the middle. While not a world-beater, this is a nice encapsulation of what Campbeltown has to offer. The ABV plus lack of too much oak or vanilla make me think that the casks going into this are fairly young and not too active. I also didn't get much in the way of sherry, so I'm guessing they're mostly ex-bourbon hogsheads. These notes jibe fairly well with my memories of the CV series from Springbank, but with some additional notes that make me think there's a decent amount of Kilkerran in the mix as well. The nose is clearly the best part, showing a lot more subtly than the palate. For a review from the Edinburgh shop's living cask, check out Whisky Rover.